I’m a day late since this collaboration officially launched yesterday, but have you seen the kate spade Saturday and West Elm collaboration? It’s so fun. I’ve loved Saturday since it launch a couple years ago and have a dress and their infamous weekender bag (my hubby got me one for Christmas!). I find the design prints of Saturday interesting and colorful, 2 adjectives I appreciate in both my style and home decor. Saturday has a few housewares so it only makes sense they’d team up with someone like West Elm to take home decor a few steps further. I’ve shared some of my favorite items below but you can check out the entire collection here. The Anders Chair in kate spade Saturday floral print. I want to decorate an entire room around this chair. 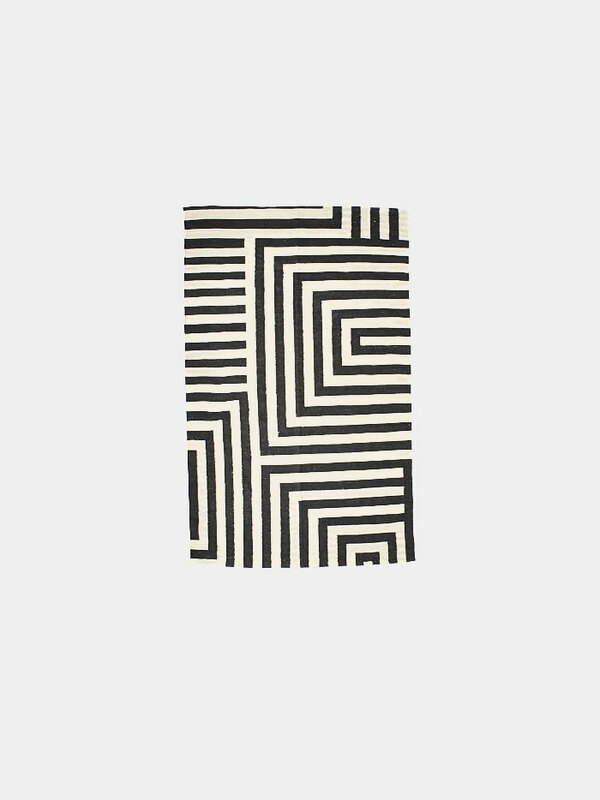 kate spade Saturday Small Scale Maze Dhurrie Rug. This is the quintessential ks Saturday print and I love that made it into a rug! I have a dress in this print, too. 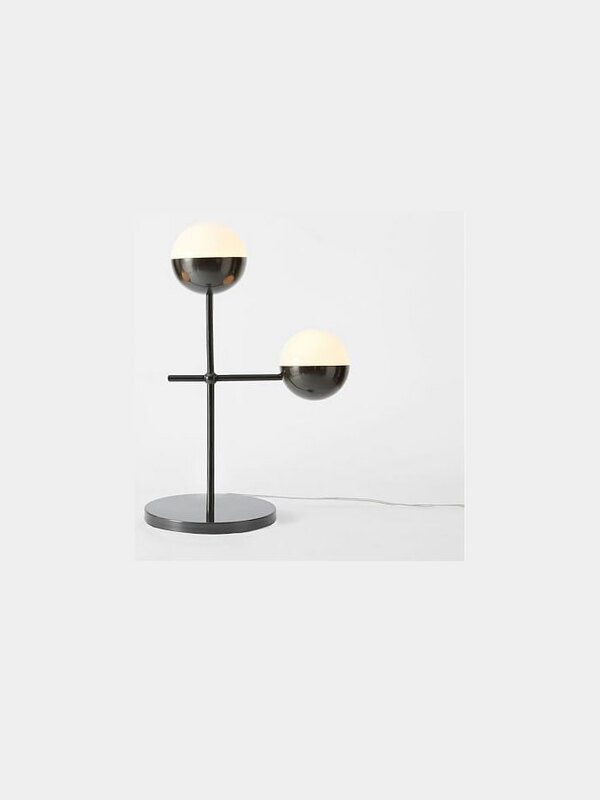 They make this kate spade Saturday Globe Table Lamp in a floor lamp too but I think it would look so adorable on a desk, right? I have been talking about showing you the baby’s nursery for weeks now and I am finally doing it! It’s been pretty much set but I was waiting to get a couple pieces of artwork up on the walls. I ordered prints from Society 6 that turned out to be odd sizes and had trouble getting just the right frames. But one is hung so I called it ready to be photographed! By the way…it’s a boy! I realized I had never formally announced that here on the blog so I thought I’d start with that because having a boy obviously helped decide the color scheme. I went with blue and green with a hint of gray for the color scheme of his room. I guess you could say the theme is polka dots, too since lots of things are polka-dotted in white. 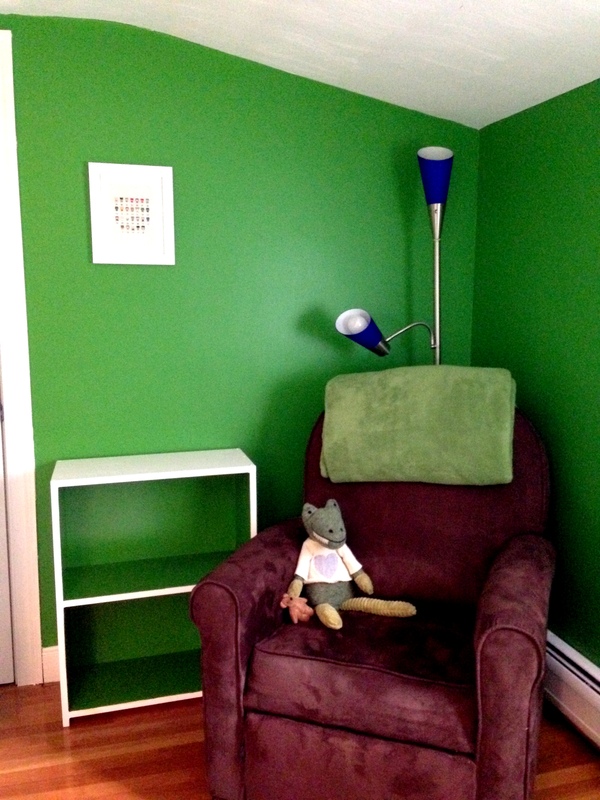 We painted the walls Cress Green by Behr paint, and by “we” I mean I picked the color and my husband did the painting. We used the nursery furniture from Z’s room (she already transitioned to a toddler bed and got a big girl dresser for her clothes) and then I found an adorable blue polka dotted changer pad cover at Land of Nod and that sort of confirmed the color scheme. You can see one of the prints I mentioned above called “Tickle Monster” and since we’re big ticklers in this house, we thought it was just perfect to hang here. Once baby brother is here, I will put a photo of the four of us in this polka dot frame you may recognize from a post a couple weeks ago (the print and frame aren’t hung yet but I wanted to include them in the shot anyway). This is the cozy corner with a small bookcase (that needs some books! ), lamp, and recliner chair that used to be in Z’s room. We bought the bookcase at an unfinished wood furniture store and my husband painted it. The second print is hung here above the bookcase – this one is of little superheros and the alphabet and it doesn’t look quite so tiny in person, must be the angle of the photo I took. 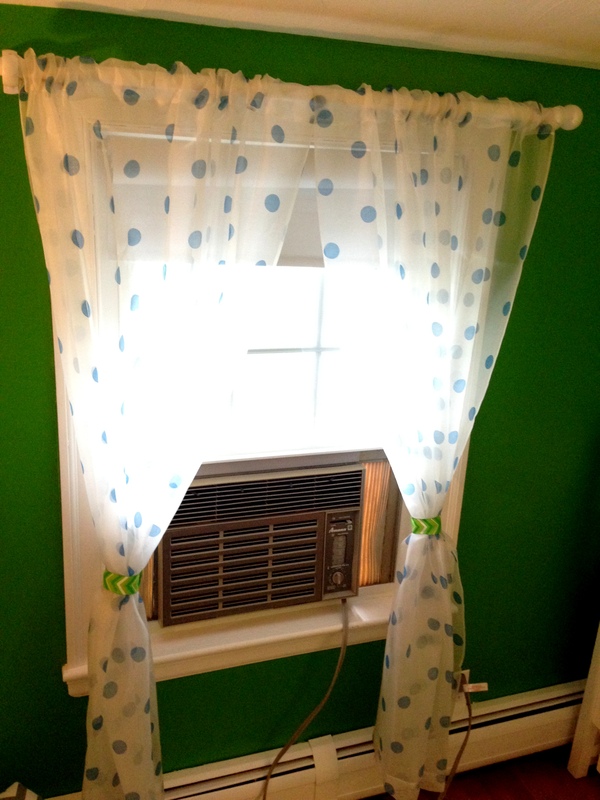 For the one window in the room we used a simple white curtain rod to match the white trim with blue polka dot sheer curtain panels and a room darkening shade for naptime (pardon the old, ugly window AC unit!). I couldn’t find any curtain tiebacks I liked so I used green striped ribbon from a gift we received and made them myself. The rug was a lucky find on Gilt and is one of my favorite things in the room. And now – the accent wall! 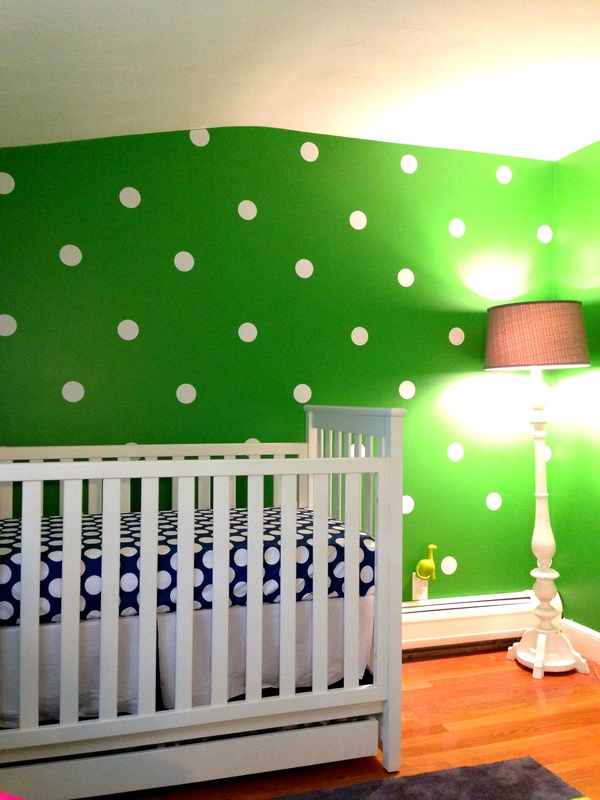 I thought it would be fun to use some wall stickers and polka dot one of the nursery walls, I just love how it came out! I found a matching crib sheet to the changer pad cover and a simple crib skirt to bring it all together. I think our little guy is going to LOVE his room! Four o’clock is referred to as the witching hour at our house. By four in the afternoon our little Z has had it with the day, she: gets hungry, gets thirsty, gets bored, gets antsy, and could really use a nice distraction. So, at four o’clock most days you’ll see us around town running errands, at the park, riding her *bike, or – if we’re especially desperate – just walking around our yard, doing laps around the house, picking up sticks, investigating the grass and other such exciting things. One recent four o’clock hour Z and I were making our way around the yard and I happened to take notice of all sorts of pretty blooms in our yard! I got out my camera and snapped some pics to share with you! Red roses! I didn’t even know we had this plant. I vaguely remember buying a rose plant when we first bought our house almost five years ago, but I thought it died. Apparently not. 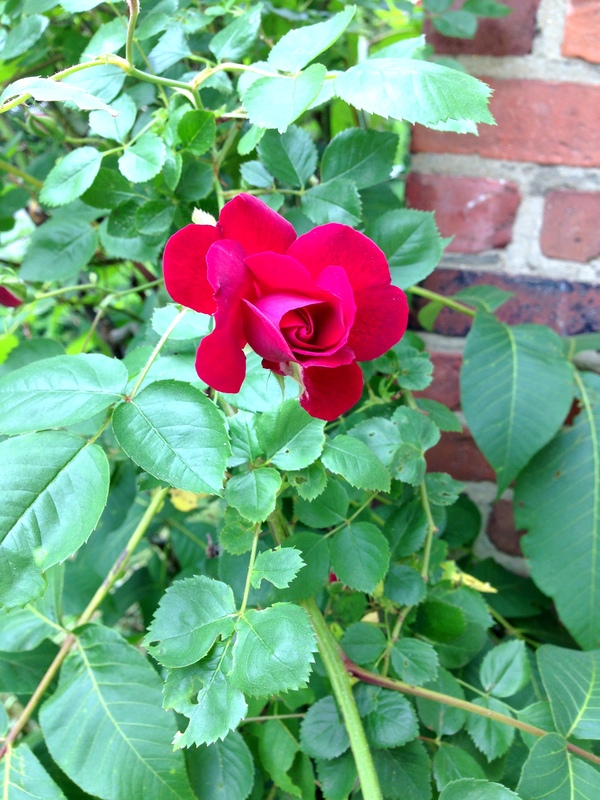 There were buds everywhere, I can’t wait to have home-grown red roses in our house soon. 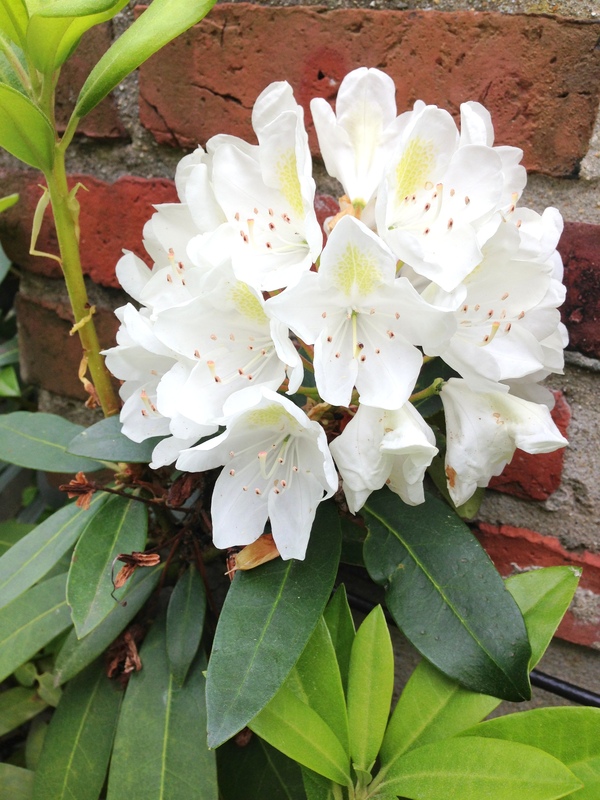 We also have white rhododendron in our side yard! 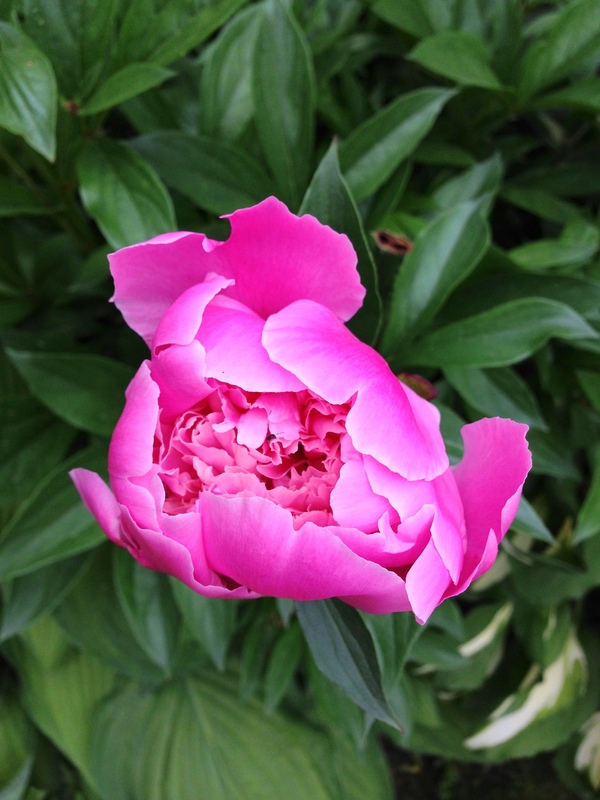 Peonies are just my favorite flower. 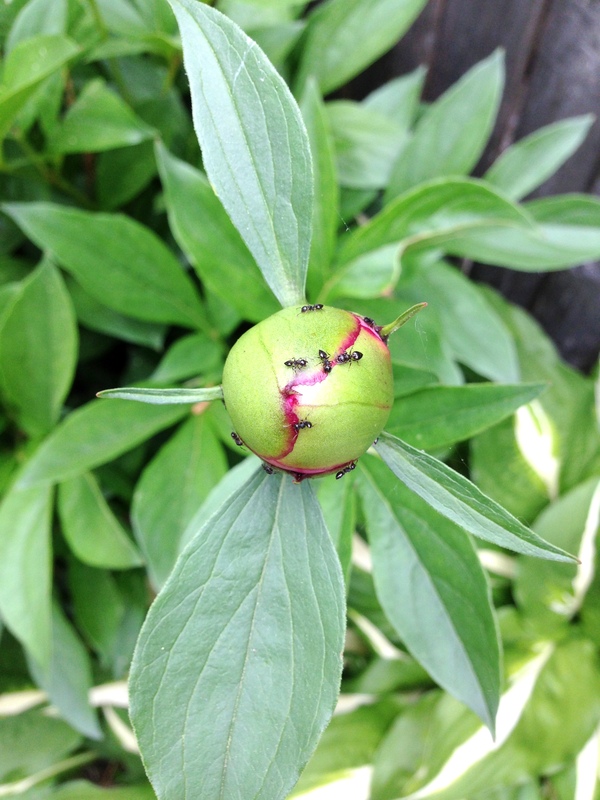 Here is one plant with the magical ants all over it getting the plant ready to bloom. Here is another just about ready to pop. 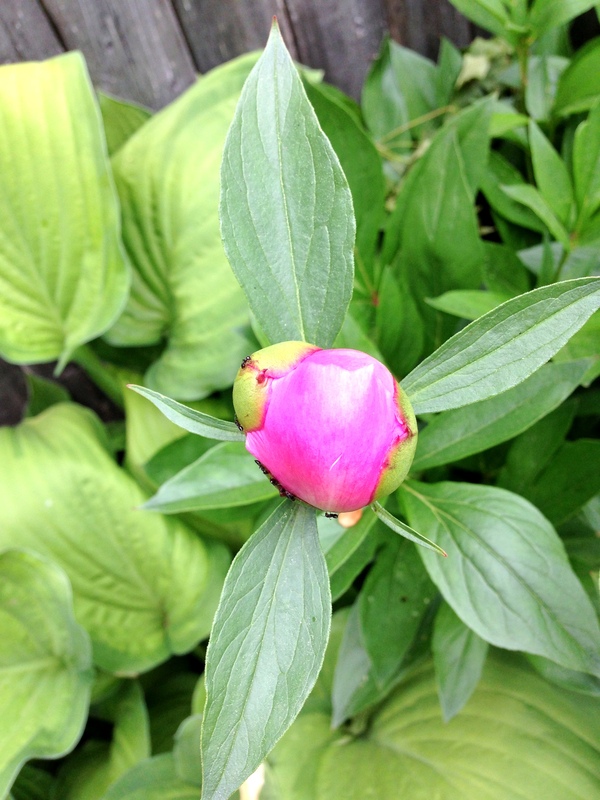 And here is one that has just started to open! 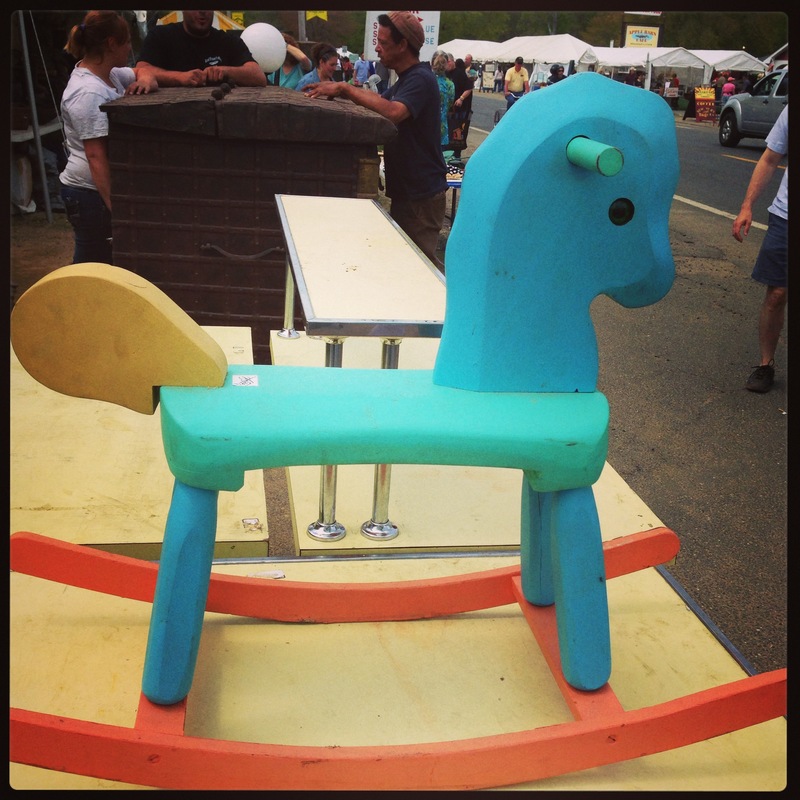 For the first time ever, I went to the Brimfield Antique Show over the weekend. From what I had read and heard it’s miles upon miles of antiques dealers, interesting food vendors, and hidden treasures everywhere. 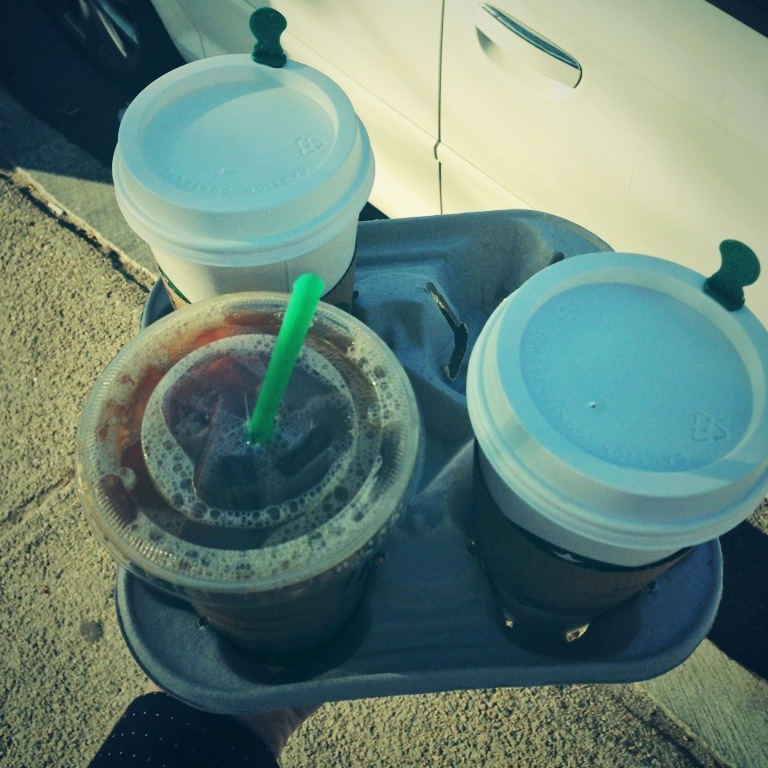 I got up super early, got Starbucks for the road, and met up with my mom and sister – Brimfield seems like a good ladies day out, right? We even drove in my dad’s giant SUV with half the backseat folded down to ensure we maximized the space we had for all our found treasures. 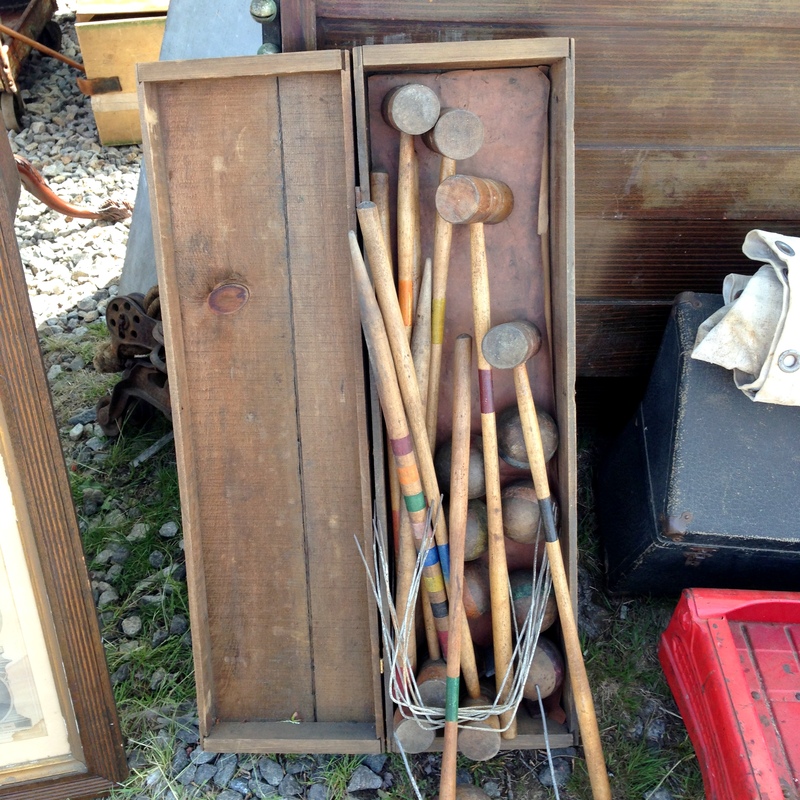 We arrived, found a parking lot fairly quickly, and started our hunt – that’s what you do at the Brimfield Antiques Show, hunt for treasures. 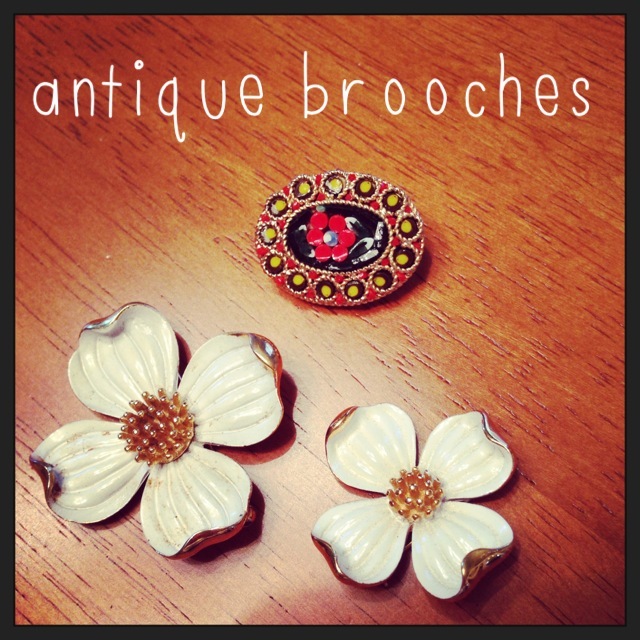 Right off the bat, I found what would be my only purchases of the day, 3 adorable antique brooches. One very colorful with blues and oranges and a set of white flowers, 1 small, 1 large. 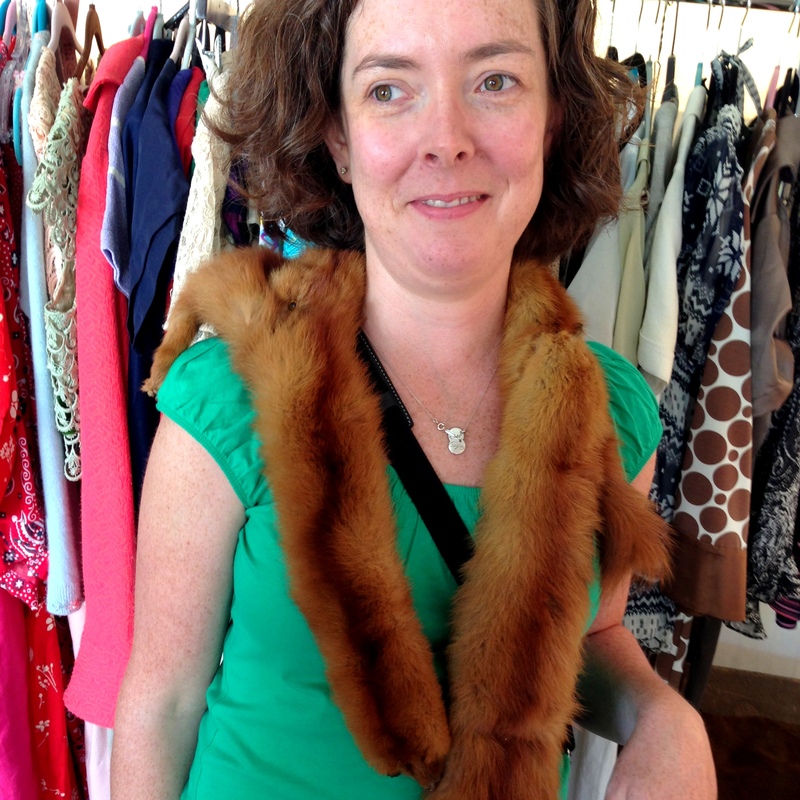 From there we really dove in to the side streets filled with things like antique croquet sets, more jewelry and clothes, lots of furniture, some art, and – quite honestly – a lot of junk. I would categorize what we found into 3 categories 1. 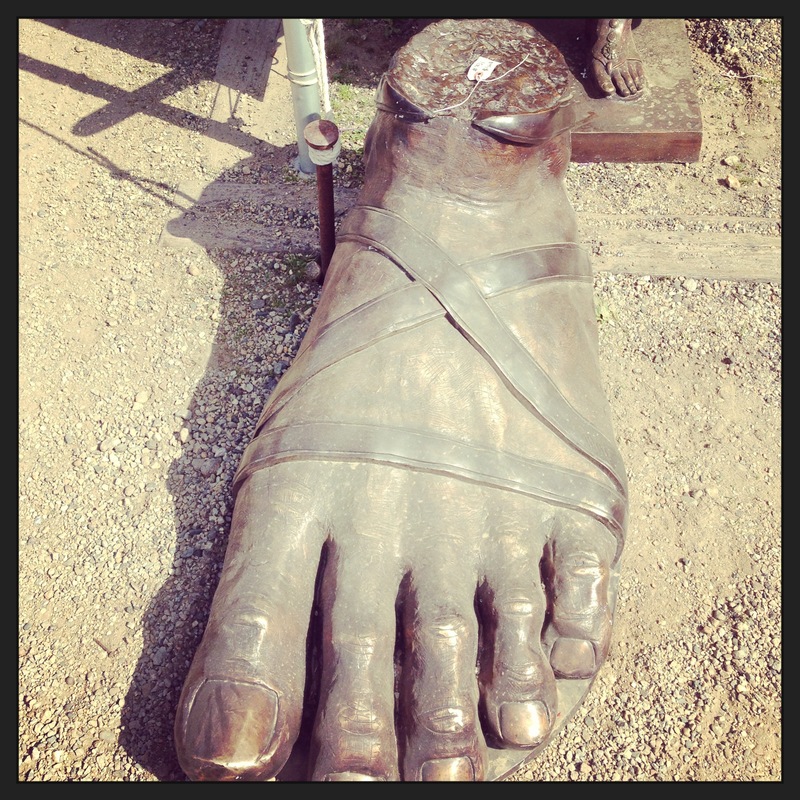 Odd (see giant foot below), 2. 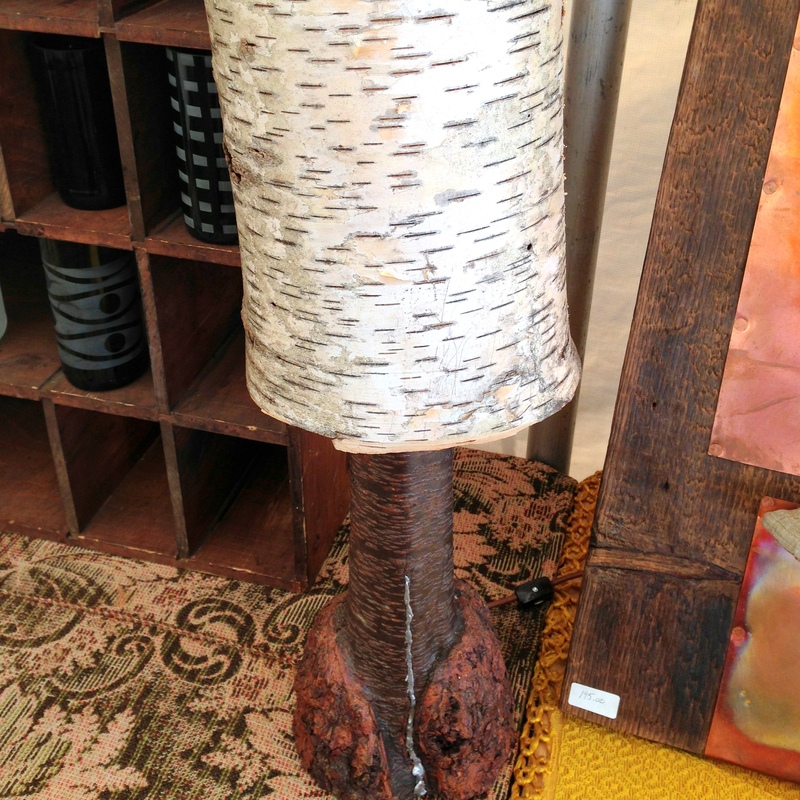 Over-priced (see the expensive, albeit beautiful, handmade birch lamp below), or 3. Junk (I didn’t really photograph the junk). Honestly, it was an experience and we had a fun day – and the people watching was of course amazing. 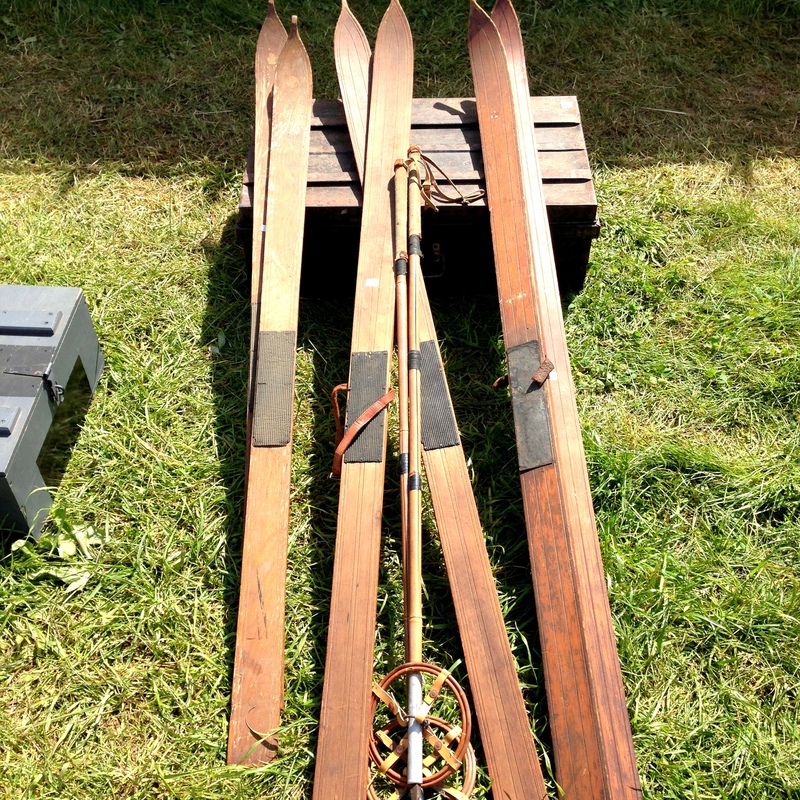 Not sure I would go again unless I was in the market for a few different things like antique furniture or if I started collecting something like Fiestaware or antique skis (see below). 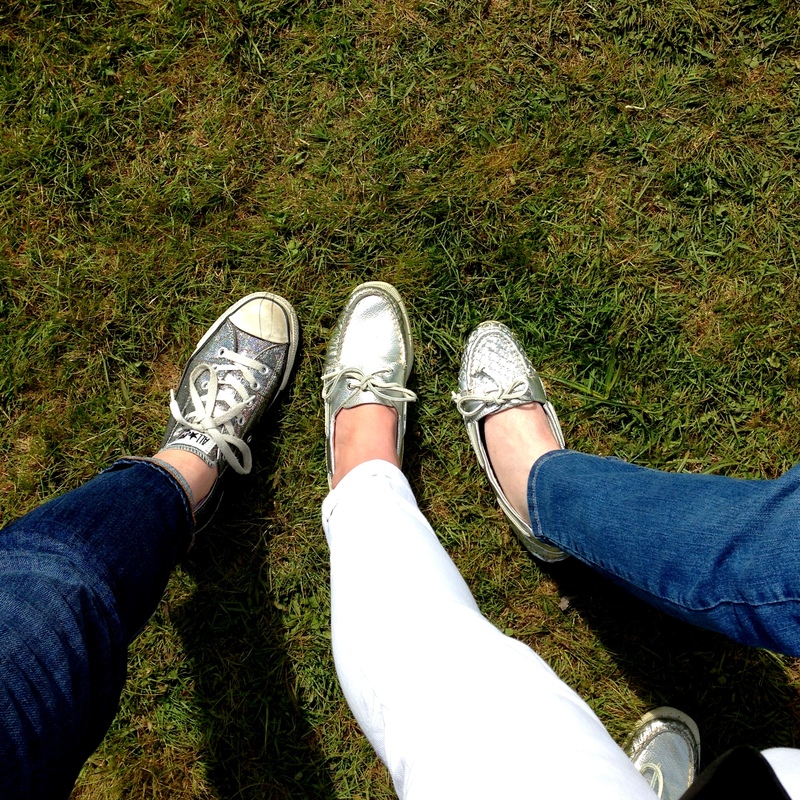 Here are some photo highlights of the day, can you believe we all happened to wear silver shoes? 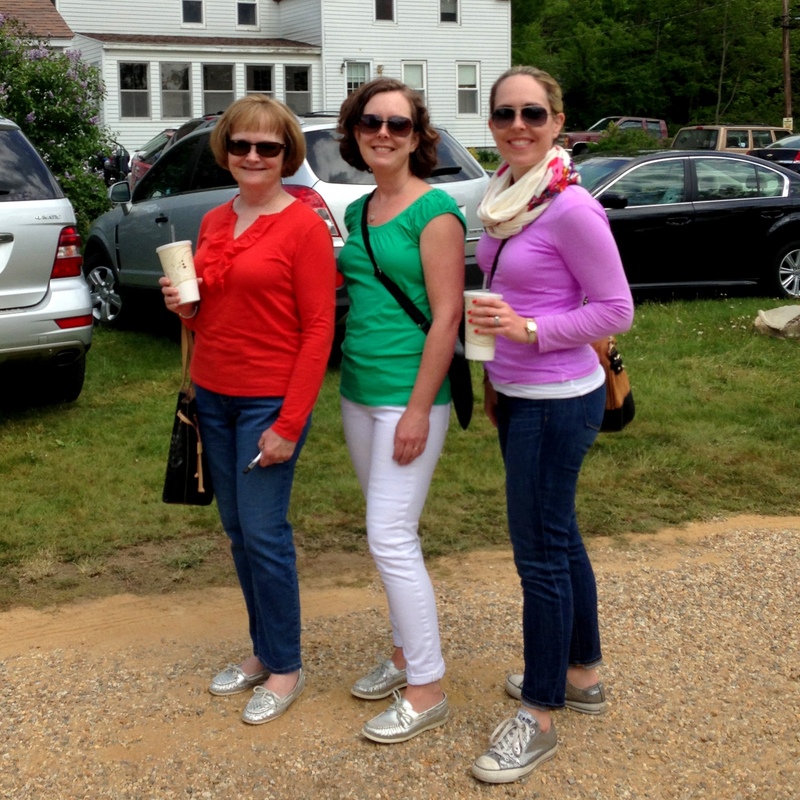 Have you ever been to the Brimfield Fair? What was your experience? My husband and I had a date night this week and attended a class on how to make croissants. We came home with croissants AND dough to make many more… more on this on Monday’s post! We went out to dinner and Z’s meal came with a Hoodsie – her first Hoodsie, I think we were more excited than she was. She wouldn’t eat it, she just picked at it with the little wooden spoon thing. I’ll have to tell her someday that she refused to eat sweets at this age…I’m not complaining and am sure it won’t last long! It was finally warm enough around here to wear sandals earlier this week! 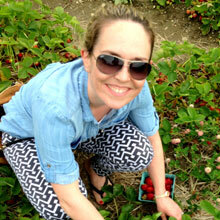 Here are a few fun links – have a great weekend!! Hunger Games will be filming in Boston this fall! A little photo tour of Kate and Andy Spade’s Southampton home. 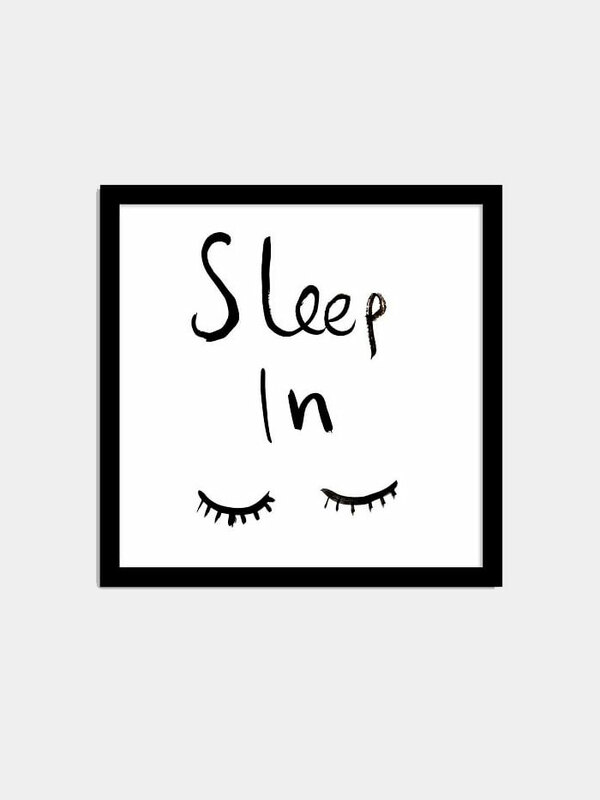 How to find a 25th hour in your day! Here’s Gwyneth looking fabulous and fashionable on her book tour. Just a little PSA about skin cancer – get your moles checked!! And I’ll end with this little prank aimed at all of us who love to Instagram pics of our food, ha! I love when he brings in his lighting guy. I just have a few photos to share this week and they’re mostly from Easter Sunday. We had a trying few days with a grumpy/tired/teething/whining girl and days like that don’t seem to beget many photos. She seems to have gotten out of her funk though just in time for the weekend! 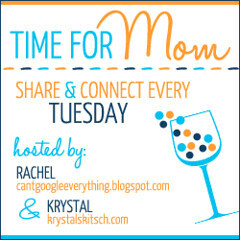 I have some fun girl plans Saturday night (shower and mom’s night out!) but other than that we’ll be doing some good old hanging out as a family. Here is a photo from our first egg hunt on Easter Sunday, Z kept the ears on the entire time and found all 8 hidden eggs all by herself! We did seem to capture a nice family photo at our second egg hunt of the day and look how proud she was of herself after gathering another 6 eggs at our Church egg hunt! We brought this orange and poppy seed cake to Easter dinner and it got rave reviews, you should definitely try the recipe! After Z’s crazy days I immediately bought this book. Have you read it? Was it worth buying? New Great Gatsby trailer – can’t wait to see this movie! We just bought our Z a play kitchen, but the link to this DIY one has been floating around this week, I love it! Game of Thrones’ Facebook page. We have a new favorite bedtime book in our house! So when I saw this book about a kitchen utensil I knew it would be a hit. The plot is about a sad little spoon unhappy with his “boring life” as compared to his friends – the exciting knife, unique chopsticks, and more. But then his mom and dad help him realize he has exciting things in his life too – like diving into a bowl of ice cream! We can’t wait to read Chopsticks next. *all photos by me of Spoon by Amy Krouse Rosenthal, Illustrations by Scott Magoon.